An East Lothian woman who smashed a glass into a woman’s face at a Michael Jackson tribute night is facing a jail sentence. Pamela Butler launched a glass jar at victim Marife Libres after the pair had bumped into each other at the Jacko concert night at the capital’s Corn Exchange. Butler – who was dressed in a military-style jacket, black hot pants and knee-length socks – then ran off leaving her shocked 29-year-old victim covered in blood and needing 15 stitches to treat a head wound. And in the days following the assault Butler then pleaded with pals to delete photographs from the Jacko event from social media sites after the attacker’s description was released to the media. Butler, from Musselburgh, East Lothian, is now facing a custodial sentence after it was revealed this was her second horrific assault on a woman. The 25-year-old thug was forced to pay first victim Donna Fleming £2000 in compensation after she knelt down and sank her teeth into the woman’s eye during a fight in her hometown in August 2012. Edinburgh Sheriff Court was told finance assistant Butler had attended the Jackson tribute night with a pal and both were dressed in fancy dress on October 30 last year. Fiscal depute Roseanne Chapman said: “At some point during the evening both Ms Libres and the accused became involved in an altercation. “There is a suggestion the accused told Ms Libres to ‘F**k off, you Chinky’. What followed is the accused was observed picking up a glass jar from a table and throwing it towards Ms Libres. “It hit her on the left side of the forehead and she began bleeding heavily due to the impact. Blood could be seen pouring down Ms Libres face. Ms Chapman added the blood-soaked victim, who is of Filipino descent, was then rushed to hospital for treatment to the 7cm laceration on her forehead which required 13 stitches. Following her arrest Butler’s phone was seized and conversations with pals on the WhatsApp site showed she had “asked another to make sure those photos are deleted from that event”. Butler told pals she would be in “deep sh*t” if the pics were not deleted and added “I’m on my last legs with the police”. Jennifer McEvinney, defending, said her client lives with her mother and is a “young woman with a direct analogous conviction”. Ms McEvinney added: “She has no experience of custody and I would ask your Lordship to order reports and continue her present status. Sheriff Frank Crowe deferred sentence for reports and a restriction of liberty assessment to next month. Butler pleaded guilty to throwing a glass into the face of Ms Libres which struck her on the forehead to her severe injury and permanent disfigurement at Edinburgh Corn Exchange on October 30 last year. She also admitted to asking another to destroy evidence on social media with the intention of perverting the course of justice on November 3 last year. 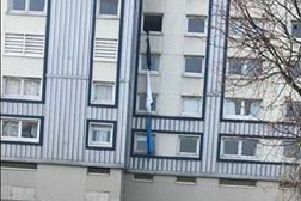 Butler was also sentenced to 225 hours of unpaid work and ordered to pay Donna Fleming £2000 in compensation after following a street battle in Musselburgh in August 2012. Butler left her victim in agony after she knelt down beside the woman and bit her right eye. Ms Fleming suffered a V-shaped laceration to her eyelid and was forced to undergo surgery the following week.